The Axis Virtual portion of family.axis.org has moved to virtual.axis.org. Moving forward, please login to Axis Virtual at virtual.axis.org/wp-login.php. These pages will no longer be maintained beginning 01/22/2015. To access the latest content please use the virtual.axis.org site. Thank you. Please email support@axis.org with any questions. Gossip. What is it? Why do we do it? How does it hurt us? What can we do to stop it? Find out with the Axis Team. 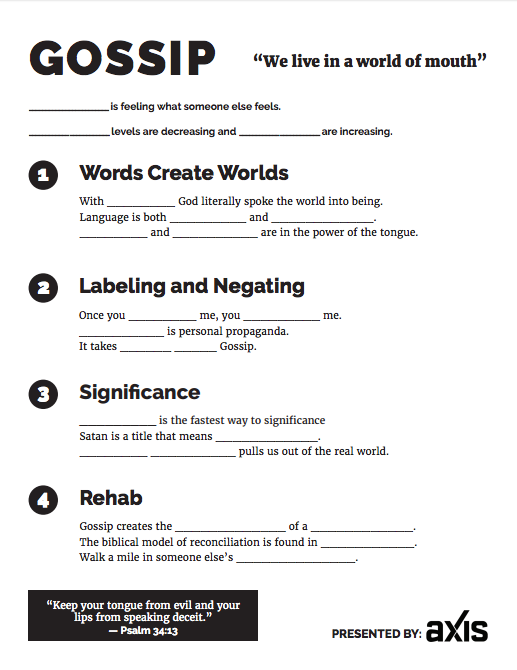 Use this fully built presentation to continue the conversation about gossip. The full Gossip presentation is also provided to you in four distinct 6-11 minute segments. Use these modules to view the presentation in 4 parts. The Axis CEO, David Eaton, sits down with Focus on the Family’s Jim Daly to discuss how to be winsome as Christians in a world that continues to go crazy. An Axis Team presents on what it means to spend ourselves for the sake of others in order to free others and ourselves from slavery. Due to several recent news stories that reveal the broken and fallen nature of humanity, we wanted to offer our archived content on the problem of evil. This timeless content will give you a starting point to start a conversation with your students about what evil is, why does it exist, and what do we do about it. For more content, click on a Topic below. Need help setting up Axis Virtual?